Regional Information Center "CARPATHIANS" » CHERVONA SKELYA (“RED CLIFF”) STREAM. CHERVONA SKELYA (“RED CLIFF”) STREAM. 48°” 10′ 57″ N lat; 23° 16′ 05″ E long. 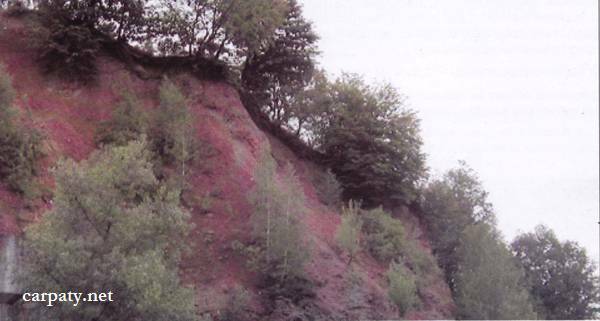 At the eastern outskirt of Khust city in erosion cliff remnant which is called “Chervona Skelya” (“Red Cliff”) there are exposed andesites overlapped by agglomerate andesite tuffs (Late Sarmatian-Pannonian). Rocky cliff is about 15 m high and up to 100 m long. 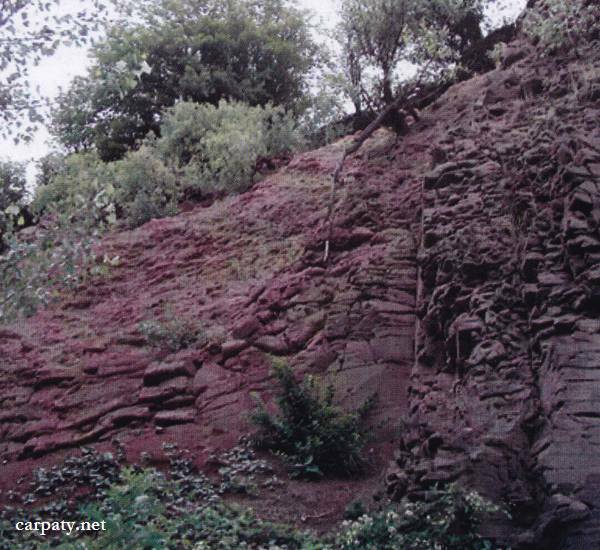 Due to extensive iron mineralization the rocks (especially tuffs) are bright-red colored and comprise typical weathered crust. At this place it is preserved from erosion breakdown because of low-energy relief and lack of destroying water streams. Chervona Skelya is accompanied by sad legend which tells that in ancient times the local lord Khust ones mistakenly considered his son as Tatar enemy and killed him at this place. And when he then recognized his son in the killed man he was so distraught with grief that made suicide. Thus blood of father and son covered the cliff. This is the only outcrop in Trans-Carpathian where typical and thick weathered crust is preserved from erosion. Accessible by motor-car ‒ northward from the road bridge Vynogradiv – Khust.